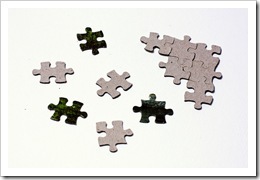 Today’s organizations are puzzles without the top. There is no picture to guide us in how to put all the pieces together. We don’t even know if we have all the pieces or even the right ones. This is why the shift from the Organizational age to the Organic one is so daunting for most of us. We are use to seeing the box top, knowing what’s inside, and feeling satisfied when we’ve completed the puzzle assigned to us. The structure of the Organic organization is also like a puzzle, However, instead of the box being filled with all the pieces that we need, the pieces come from a random puzzles. Instead of each person sitting at the table looking at the pieces that came in their very own box, and by themselves working on their puzzle, they are talking with each other about what new picture their puzzle will look like. The skills of leading in an Organic structure have more to do with making sense of what is before you than following a formula that has already been determined in advance. 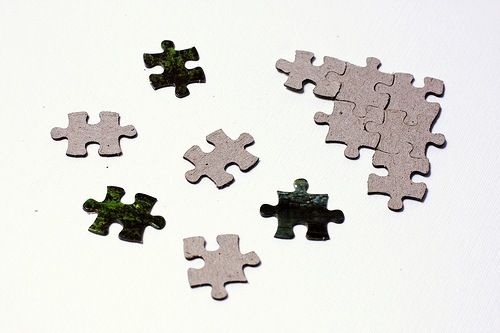 What is on your puzzle table? What are the pieces? How do they fit together? Or do they fit? What about the people in your life and work? How do they fit? How are you connecting with them? Do you share just a common social or cultural experience? Or, do you have a common purpose that gives greater depth to your relationship? What do you do together? How often are you in touch? What are you doing with social media like Facebook, LinkedIn or Twitter? Is your participation for amusement and social interaction, or something more purposeful? What about the social environments where you live each day? Does your work, home and social life fit with the values that are important to you? Does your life purpose drive your professional life, your personal life or both or neither? These are all questions that point to the puzzle pieces that are lying upside down, right side up and tilted on the table of your life and work. And there is no puzzle box to tell you what the picture is. The Organic age requires us to be creative, to take all these pieces and create our own picture. However, it isn’t just my picture but our picture. Our life and work is not just one table of pieces, but multiple tables that we share with other people. Together we create a picture from the pieces that makes sense and displays real beauty. The more we join these tables together, the better picture we can create. The Organic way takes the random pieces of our lives and creates something beautiful from it. Let’s take this one step further. How does this picture of Organic development fit into the traditional settings of institutions developed during the Organizational age? Simple, sort of. Look at the organization of your company as a collection of tables, at each table is a team, a department, or office. They each have a collection of puzzle pieces. These are the relationships, the structures and the ideas that guide the work they share. In an Organic context, the group works together to find the opportunities, resolve the issues, and work to achieve new levels of success. In some respects, they are self-contained collections of individuals.They can also be a collection of groups who represent different sets of puzzle pieces that need a lot of coordination to create their collaborative picture. The Organic puzzle takes everyone’s participation to create the picture on the box that emerges from the collaborative puzzle solving. Structures, which are task oriented, where individuals are order fulfillers rather than creative contributors, are representative of a past where everyone was given the box of pieces and told to produce the picture. Those days are slipping away as complexity become increasingly dominant experiences for people. Organic leadership is based on the engagement of everyone within an organizational context to be creative contributors. Unless there is openness and support, it will not develop. With it, the picture on the box is of a future that is worth creating. I'm a leadership speaker, writer and consultant who is a mentor and catalyst for change. I assist leaders and their teams in the transitions required to succeed in today's complex organizational environment. I live in Western North Carolina. I'm involved the Boy Scouts, a charitable leadership training group called Lessons In Leadership, an ordained Presbyterian Church USA minister, and am the host of the Say Thanks Every Day social network. Posted in General Leadership, Leadership Q + A, Work Life Lead. Tagged with contribution, creative, leadership, organic, organization, participation, pieces, puzzle, questions, random. I think you're right, it is scary but it's also exciting. Creating an organization without preconceived ideas about structure shakes things up and allows us to see what's possible instead of what "should be". Leaders who are open to finding the best use of potential are going to find better ways of organizing. Technology is helping to fuel that fire and shows no sign of slowing down. Leading to more efficient organizations in the future.